Founded in 2007 as SynthaSite, this web builder was renamed Yola in 2009. Another major change was moving the company headquarters from Cape Town, South Africa to the silicon realm of San Francisco. 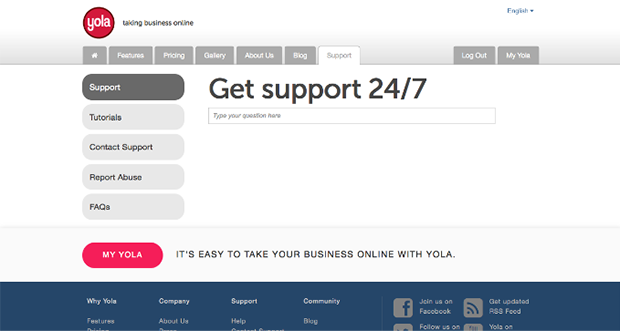 Yola is primarily a website builder, but also a web host. So, is this change in name and continents an indication of a wishy-washy product? Or will Yola stay put for the long run? The process for getting started with Yola is pretty standard. You’ll first be asked to provide your name, email and password. Next, you’ll choose your design template, which you can preview live before making your final selection. After that, you’ll have to choose your domain. Optionally, you can add information that will automatically be added to your contact page, like your address and phone number. At this point, you’ll be taken to the website builder and you’ll be ready to roll. 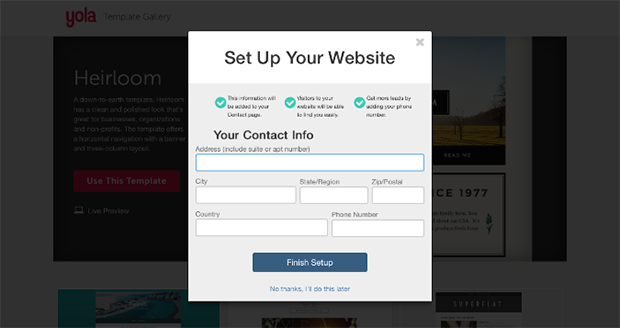 You’ll also receive several emails that will guide you through the initial steps of setting up your website. You’ll automatically be given a domain with the yolasite.com extension. 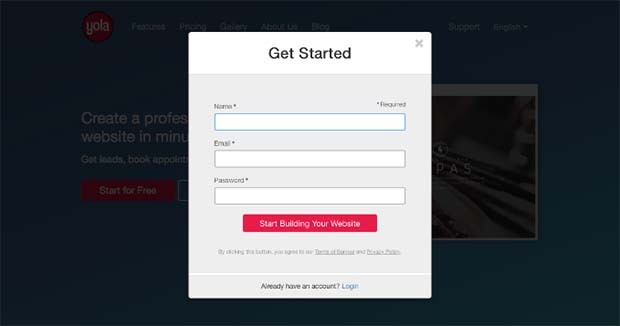 If you want to connect a custom domain, you’ll need to upgrade to a paid package .The editor is drag and drop, but it’s more than a little outdated. More precisely, it’s very outdated. Think of the certain word processor circa early 2000s combined with an old browser that has too many favorites and tabs open and you’ll get an idea of the overall look. There are a lot of features to play with—even with the free package. But upselling is aggressive and constantly present, which is annoying. The fact that the native advertising is not removed in the lowest paid package is also somewhat baffling. 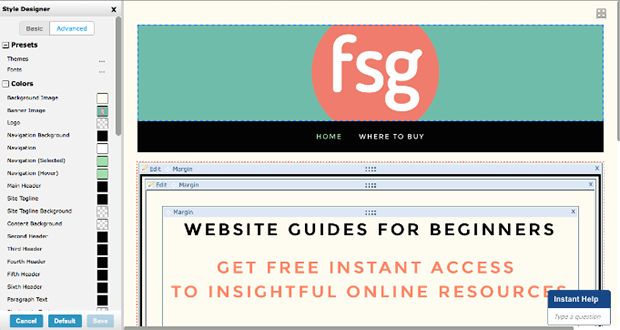 When it comes to customization of website pages, you’re stuck with pre-defined page outlines. There’s no way for you to adjust code, columns or rows. This can be pretty annoying if you want to be 100 percent in control. If you want to test out features, not all of them will be available. There is a 30-day, money-back guarantee. But we think that a 14-day trial for excellent online store would be more useful. SEO is also not available in all packages, which is something we can’t overlook. For now, the design templates are holding up. They look fairly decent on mobile devices, but keep in mind that not all themes are responsive. On the positive side, when it comes to customization of the style of your website (fonts, colors, images, etc. ), you’ll have comprehensive options. Email is also available for $9.96 a year. All in all, it’s a roller coaster ride when it comes to options and cash outlay. Dazed and confused describes our initial reaction to the Yola editor. The trouble is, the editor itself is not only outdated looking, but outdated in its structure, too. In the upper part part of the screen, you’ll see no fewer than three toolbars. 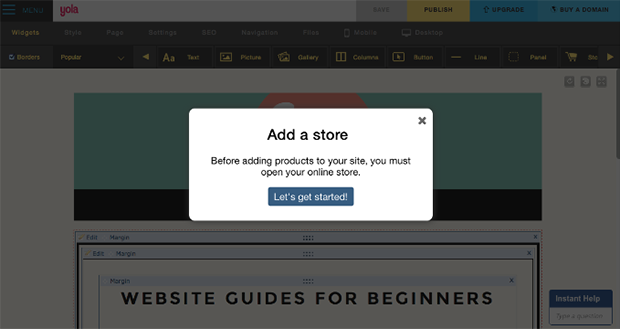 Below that, you’ll have an outline of your website that’s drag and drop, but not 100-percent customizable. Elements will snap only to certain predetermined places. You can add pictures by clicking Edit but you can’t change their alignment. Text is edited directly double clicking on it and there will be a lot of pop-up menus, either on screen or on the right side. The learning curve will be significant because interface is clunky. And you’ll be faced with pervasive upselling. When you finally get to the point where you can actually edit your website, you’ll get a sample template filled with the preexisting text. (In our case, we had to remove a lot of farming references.) You also have the option of starting with an empty template. On the previously mentioned upper toolbar, you will have Menu, Save, Publish, Upgrade and Buy a Domain buttons. While most of them are self-explanatory, Upgrade is for upgrading your package and Menu is where you can access your sites, your account, help and logout. It’s worth mentioning that you’ll find analytics under Current Site. 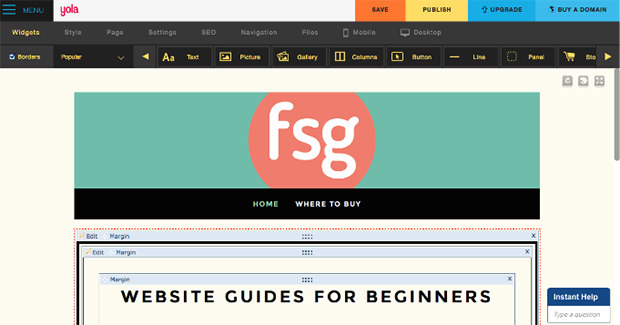 The middle toolbar is where you’ll find most of the tools you need to build your website. There are Widgets, Style, Page, Settings, SEO, Navigation, Files, Mobile and Desktop. Under Widgets you’ll find all the elements you need build a page, including the empty HTML which enables you to install any third-party widget your heart desires. Style will let you work with fonts, heading, colors and such. Page is where you’ll edit pages and add new ones. In Settings, you can fiddle with favicons, password protection, Google Analytics and publish or unpublish your website. SEO and Files are self explanatory and Navigation will let you rearrange your pages. Lastly, Mobile and Desktop will let you adjust your website and how it appears on mobile or desktop devices. The Free Yola package offers a paltry 10 design templates.They are decent designs, though they should probably be updated in couple years. When you upgrade to a Silver or Gold package, you’ll get more templates. The good news is that there are some responsive themes. The bad news is that if your template is not responsive and you want to adjust your design for mobile devices, you’ll have to pay extra for a Mobile Publishing widget. Fortunately, Yola has its own online store that you can integrate with credit cards and PayPal. It will allow you to set your own language, tax based on the customer’s location, shopping profiles, order tracking and integration with local and international shipping providers. Unfortunately, there is no way for you to test the feature unless you pay for their Silver or Gold package. Overall, the store, unlike some other widgets, is nicely done and easy to use. SEO is available only in the Gold package. While this might seem like another “the more you pay the more you get” situation, SEO is included in basic packages with most website builders. This feels like another way to gouge unsuspecting users. Statistics are nicely done, although the first time around we had to wait a couple hours for them to work. So they either are not tracking things in real time or they are just initially lazy, because this is not an issue with competitive web builders. Keep in mind that you can work around this by linking to Google Analytics. Uploading or exporting your website is consistent with the majority of the competition: non-existent. While we wait for this trend to change, we at least know that the hosting needs at Yola are taken care of. Capabilities and storage will vary from package to package, but with any paid package you’ll get a free, hosted, custom domain. This is pretty standard throughout the industry. When it comes to help, Yola is a bit strange. While we frown upon website builders that don’t have real-time telephone or chat support, we must say that we were surprised by with the speed of answers through email support. Additionally, the staff was very helpful and knowledgeable. Their response time is one of the fastest in the industry. If you would prefer non-human contact, there are tutorials and a searchable knowledge base. While we still wonder why Yola doesn’t at least offer chat support, we also must admit that we were pleasantly surprised by the other help services. Yola offers four packages with 30-day money-back guarantees. All prices reflect yearly billing rates. Yola is a website builder with the potential to be a major player. Unfortunately, the upselling is unrelenting and many of the optional features are not worth the price. Some of basic functions seem clunky and haphazard by today’s standards, including the disorganized appearance of the editor itself. In fact, the poor quality of the editor alone leaves us wondering how Yola still exists and is even relatively well known. Granted, there are extensive stylization elements and the support staff is super fast and helpful. But the constant upselling is like mosquitoes on a summer night. It’s sad that Yola has some great features, especially the e-commerce solution, but they get overshadowed by other clumsy or dated aspects of the web builder. All in all, Yola left us with mixed feelings. It’s not a website builder that should be immediately disregarded. But to be frank, better solutions are available.